When I am going to bike somewhere that is likely to be rather tricky, I prefer to plan the route myself, using google maps. I'd like something that can take that, and deliver the turn by turn directions to me on my android phone, as opposed to a program that tries to navigate me there itself. If I get off the designated track, I'd like it to tell me, but preferably not try to re-route me. I am currently doing this manually by using the google maps app, downloading a route from "My Maps" using the "layers", and checking every so often that I haven't missed a turn. It's kind of a PITA. The app doesn't have to use google maps to do the off-phone pre-planning but it would be nice if it does, because it's a good interface that I already know how to use. I don't see a way with Buddy Runner to create or import a map. Am I missing something? I don't want something that records where I've been - there are a ton of apps for that. I want to plan a path before hand and have an app give me turn by turn directions - given that I've already entered all the turns in myself using google maps. The reason I want this is that, for example, it's pretty difficult to navigate from where I live, Pflugerville, TX, to parts of austin downtown. Spotty bike lanes, highways that are hard to cross, etc. So I spend some time ahead of time planning the way I'll go, and I'd like my phone to tell me when I have turns coming up. Wonder if Bike Hub Cycle would work for you. That looks closer and I'm downloading it, but it still sounds like it's going to want to generate the route for me. Ugh, first Bike Cycle Hub just tells me my destination is too far away no matter what I do (we're talking a mile or 2 max here). Second the search doesn't really work. I suspect this might be a UK-only kind of thing. At any rate, it does seem to want to pick my route for me, instead of letting me do it. OK, I found another -- Run.Bike.Route. As it is a pay app (99 cents) you may want to take a look at it in Android Market. And here is yet another that may meet your needs: BikeRoute. 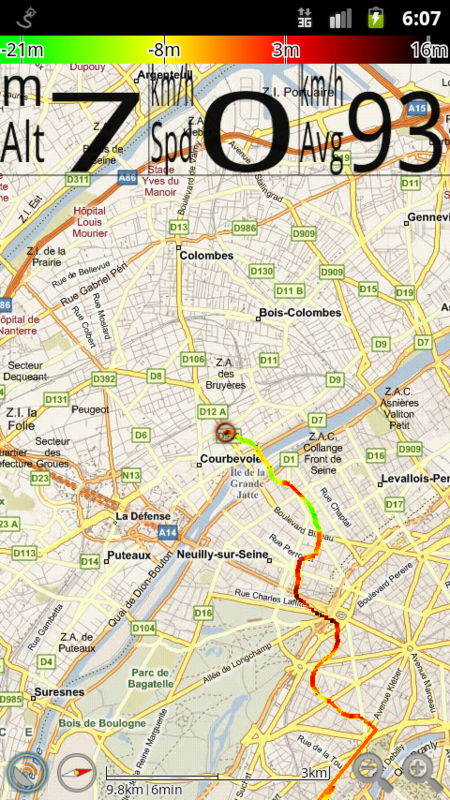 The Mytrails app allows you to display one or more gpx tracks on top of a map. Many map sources are available. You can also use offline maps if you create MGM map packages; this is a multi-step process but you only have to do it once (and offline Google maps levels 1-16 for your whole country are very nice to have). Rather unique for mytrails is that the colorization of tracks can be changed to altitude, speed, rate of ascent etc. Very useful on a bike. You can have the app follow your current postion and rotate the map according to your direction which makes it very easy to follow a loaded track if you mount your device on your bike. There are no directions whatsoever, the app will tell you nothing. The nicest part is the OpenGL rendering; all dragging and zooming is very fluent which makes the app a pleasure to use. There is a "pro" license which gives you the ability to load as many tracks as you like concurrently. You can use that to load all tracks in the neighbourhood and switch following one track after another.